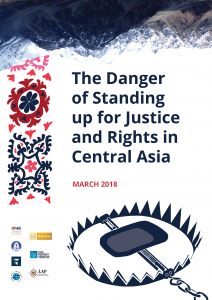 A new report jointly published by seven NGOs documents the increasing risks facing those who stand up for justice and human rights in Central Asia. At a time of a global backlash against civil society, Central Asia is no exception: the space for civil society is seriously limited in this region and its governments impose far-reaching restrictions on free speech, association and peaceful assembly. The new NGO report examines key trends regarding the protection of civil society in the five Central Asian countries of Kazakhstan, Kyrgyzstan, Tajikistan, Turkmenistan and Uzbekistan in 2017. It is published by International Partnership for Human Rights (IPHR) together with Kazakhstan International Bureau for Human Rights and Rule of Law (KIBHR), the Legal Prosperity Foundation, Nota Bene, the Lawyers’ Association of Pamir, Turkmen Initiative for Human Rights (TIHR) and the Association for Human Rights in Central Asia (AHRCA). It is primarily based on monitoring carried out by the Central Asian NGOs of developments in their respective countries and draws on regular updates they prepare with IPHR in the framework of the CIVICUS Monitor, an initiative aimed at tracking civic space worldwide. “We want to draw international attention to the difficult situation for civil society in a region that is often overlooked and mobilise support to hold its governments to account for violations of fundamental freedoms,” said IPHR Director Brigitte Dufour when explaining the purpose of the report. “In particular, we want to highlight the plight of individuals who are subjected to intimidation and pressure because they challenge injustice and impunity and dare to stand up for what they believe in,” she continued. As documented in the 59-page report, Turkmenistan’s government continues to tightly control the dissemination of information and suppress dissent and views any independent civil society activity as a threat. Uzbekistan’s new president has taken some steps to break with the repressive practice of his predecessor, but he has yet to initiate systematic human rights reform and take meaningful steps to loosen the screws on civil society. The situation in Kazakhstan, Tajikistan and Kyrgyzstan has significantly deteriorated, with those in power exploiting concerns about national stability and security to justify measures that curtail fundamental freedoms and civil society activities. Against the background of the economic downturn, elections and high-profile international events taking place in the region, the authorities have become more intolerant of those who scrutinise and criticise the shortcomings of their policies, in particular on social media and other online platforms. In 2017, the space for freedom of expression and independent civil society engagement continued to shrink in Kazakhstan. The few remaining independent media outlets faced pressure and journalists, social media users, civil society activists and other government critics were prosecuted, detained and imprisoned on criminal charges of “inciting” discord, spreading false information, defamation and other alleged offenses in retaliation for their exercise of freedom of expression and other fundamental freedoms. New legislation initiated by the government on communications and information, the legal profession and religious practice gave rise to concerns among civil society about increasing restrictions in these areas. NGOs were subject to close oversight, with several foreign-funded human rights NGOs being investigated and sanctioned for alleged tax violations. The country’s largest independent trade union was closed down for allegedly failing to comply with the strict registration requirements set out by law and trade union leaders were among those charged and convicted of criminal offenses in politically motivated cases. The authorities continued to interfere with the rights of residents to peacefully assemble and voice their concerns, including by detaining, questioning and penalising civil society representatives for taking part in gatherings or discussing plans for such events on social media and by declaring peaceful workers’ strikes unlawful. During the year, the climate for free speech and civil society engagement deteriorated in Kyrgyzstan. Outgoing President Almazbek Atambayev, who was not allowed to run in the October presidential elections because of a constitutional term limit, demonstrated growing intolerance to criticism and verbally attacked journalists, human rights defenders and others who challenged his policies, accusing them of seeking to destabilise the situation in the country. He also initiated financially crippling lawsuits against independent media and journalists, called for increasing control of NGOs and oversaw the introduction of yet more restrictions on fundamental rights. Several journalists faced criminal cases because of their writings. Atambayev-supported candidate Sooronbai Jeenbekov was elected president in the first round of the elections held on 15 October 2017, with over 54 percent of the vote. The elections provided for a peaceful transition of power, but the use of so-called administrative resources in support of Jeenbekov significantly influenced the outcome. During his campaign, Jeenbekov pledged to continue Atambayev’s policies, although he also set out to respect human rights, guarantee freedom of expression and improve cooperation with civil society. Civil society expressed hopes that he would take concrete steps to break with Atambayev’s troubling legacy on free speech and human rights and act in support of these values. However, during the first period after Jeenbekov’s inauguration in late November, no significant steps to this end were observed and the situation remained of concern. The space for civil society continued to contract in Tajikistan in 2017 due to wide-ranging restrictions on fundamental freedoms. Independent media, journalists and others who criticised government policies faced growing pressure, and the authorities unduly limited the use of online resources. NGOs continued to be subjected to intrusive inspections by state bodies and were excluded from non-transparent processes of drafting new legislation affecting them. The independence of the legal profession remained under threat and lawyers working on high-profile cases were criminally prosecuted and imprisoned. Problematic legislation, as well as arbitrary law enforcement measures undermined the right to freedom of peaceful assembly. The UN Special Rapporteur on freedom of opinion and expression raised alarm about the current restrictions on independent media, civil society and dissident voices in the final report on his 2016 mission to Tajikistan, which was published in June 2017. He called on the Tajikistani government to reconsider its current focus on repression of fundamental rights as means of ensuring security and public order, warning that this approach “may be undermining the very […] goals the Government purports to be pursuing”. The civil society climate in Turkmenistan remained fundamentally repressive in 2017, as shown by bottom rankings given to the country in international freedom ratings. President Gurbanguly Berdymukhammedov was re-elected with a reported 97.7 percent of the vote in unfree and unfair elections held in February 2017 where he faced no real competition. Following amendments adopted in 2016, Turkmenistan’s Constitution places no limitations on how long the current president can stay in power. While the economic crisis worsened with severe implications for the population, government propaganda continued to focus on the supposed well-being and prosperity of the nation and the personality cult surrounding the president was further strengthened. The authorities suppressed the dissemination of information about problems in the country through strict state media control and censorship and stepped up pressure on critics, monitoring, intimidating and harassing them. The authorities also continued to forcibly mobilise citizens for events praising the regime, in particular in connection with the fifth Asian Indoor and Martial Arts Games hosted by Ashgabat in September 2017. The authorities invested billions of USD into these games with the aim of improving the country’s international image and took great care to ensure that foreign visitors did not gain undesirable impressions of the situation in the country, including by preventing unsupervised contacts with local residents. The repressive climate meant that there were few public expressions of discontent and the authorities took prompt measures to cut short the rare protests that there were. President Shavkat Mirziyoyev came to power in Uzbekistan after the death in September 2016 of President Islam Karimov, who ruled for 27 years. Mirziyoyev’s government has taken pains to try to improve Uzbekistan’s image in the eyes of the international community. Over 2017 the authorities took some positive steps with respect to human rights protection. These included the adoption of an action strategy on judicial reform and greater openness to international human rights mechanisms. The authorities allowed a visit by the UN High Commissioner for Human Rights in May, and a visit by the UN Special Rapporteur on freedom of religion or belief in October, which was the first visit of a UN expert since 2002. They also allowed representatives of Human Rights Watch to visit the country for the first time in years. Most notably, since President Mirziyoyev came to power, at least a dozen people imprisoned for exercising their right to freedom of expression and other fundamental rights have been released. However, at the beginning of 2018, at least a dozen others remained behind bars on politically motivated grounds. Those who have been released typically remain subject to surveillance and often experience problems with obtaining permission for travelling abroad to undergo medical treatment and visit family members. The extent to which the positive steps taken will improve the human rights situation in practice remained difficult to assess at the beginning of 2018 and, as the information presented in this report shows, much remains to be done to end systemic repression of civic space in Uzbekistan.